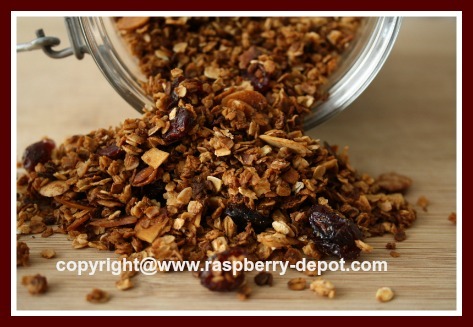 This Healthy Homemade Granola with Dried Fruit Recipe makes a nutritious cereal for breakfast or snack time. Great idea for a healthy kids' snack! You can very easily substitute ingredients to suit your preferences! I did not have dried raspberries on hand, so I substituted with dried cranberries. You can use any dried fruit, or a combination of different fruits. Not only is granola you make yourself much better tasting, it is also more frugal, and of better quality, because YOU control what the ingredients are! Spray a large size jelly roll baking tray, or a cookie baking tray with sides, with non-stick cooking spray. In a large size bowl, combine the oats and the almonds and set aside. In another bowl, combine the honey, butter, vanilla extract, cinnamon and the salt, and mix until well combined. Add the honey mixture to the oats and almond mixture and stir well to combine. Spread the combined mixture evenly in the prepared baking tray. Bake at 350° F for about 20 - 25 minutes, turning mixture with a spatula every 5 minutes. Granola is finished baking when the oats and almonds turn a golden brown colour. 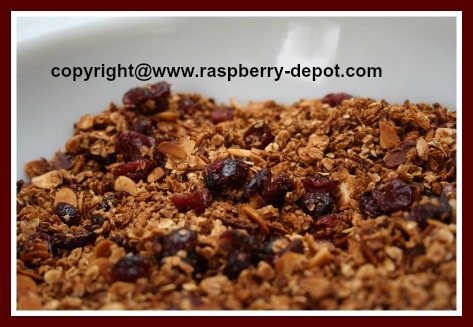 Be careful not to over bake the granola - the mixture turns too dark very quickly near the end of the timing! 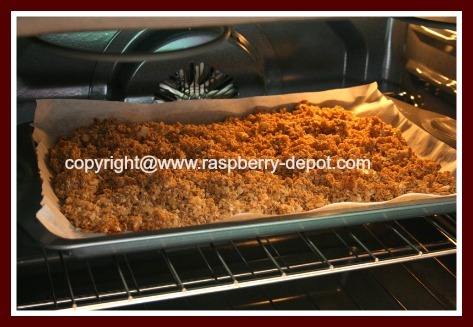 Remove the baked granola from the oven and transfer it to the large bowl.